Jessica Harrington became the most successful female trainer ever at the Festival after Supasundae claimed a decisive two length victory in the Coral Cup. Always travelling well throughout the two mile and five furlong contest under Robbie Power, the seven-year-old son of Galileo travelled powerfully entering the home straight and found plenty for pressure after winging the final flight to draw away from second-placed Taquin Du Seuil, trained by Jonjo O'Neill. Alan King's Who Dares Wins was a further two and a half-lengths back in third, whilst Noel Meade's 66/1 chance Monskland was a length behind in fourth. Harrington was level with Jenny Pitman on eight Festival winners coming into the this year's meeting, but Supasundae's success now makes Harrington The Festival's winning-most female trainer with nine victories. The gelding was originally trained by Andrew Balding before he was purchased by Ann & Alan Potts, going on to finish sixth in the 2015 Weatherbys Champion Bumper and seventh in the 2016 Sky Bet Supreme Novices' Hurdle at The Festival for Henry De Bromhead. "I've taken time to get to know him. He has run well on his last two runs but was just getting stuck in the mud and the more it dried out, I thought he would be a different horse on good ground. He is Flat-bred and really liked that good ground. "He's run in the Champion Bumper and Supreme Novices' Hurdle at the Festival so it's good that a horse can come here where he has run before and he was just brilliant today. "Robbie gave him a lovely ride. He was always where he wanted to be, had a little bit of space and was just off the pace. "It is absolutely fantastic. I inherited Supasundae this season from Henry de Bromhead. "I don't know where Supasundae will go next. He might just step up to Graded company, I don't know whether he will be good enough or we may just go for another handicap." Robbie Power returned to The Festival's winners' spot for the first time in six years following Supasundae's success in The Coral Cup. 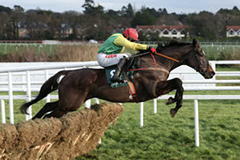 His only victory before this one came on this day in 2011 when he won the RSA Chase on Bostons Angel, like Supasundae, trained by Jessica Harrington. Power took additional pleasure in wearing the colours of Ann and Alan Potts, who sent horses to Harrington for the first time this season. The winning jockey said: "I have nearly forgotten what it is like to win a race here. To have a Festival win for the Potts in their first season with us is fantastic. "I said before the race the main priority was to get a good position and find a bit of room in a 25-runner handicap, which wasn't going to be easy. I got a perfect run - he jumped the first a bit slow but after that I got a lovely run the whole way. He's been running on heavy ground in Ireland all winter, and I was sure he would improve for better ground, and that's how it worked out. "He beat Monksland on New Year's Eve and was then second and fourth to J P's good horse Sutton Place on heavy ground. He got bogged down, but I said then, 'Let's go to the Coral Cup'. He has travelled over to give Sizing John [a Timico Cheltenham Gold Cup contender] a bit of company - he's best mates with him. It's great to get one winner, and fingers crossed we get another." Aidan Coleman rode Taquin Du Seuil, trained by Jonjo O'Neill, into second place in the Coral Cup. The 12/1 chance finished two lengths behind the winner, Supasundae. Coleman said: "I'm absolutely delighted - he gave me a great ride. He travelled, and followed the winner the whole way. He's a brilliant horse who has won a BetVictor Gold Cup [at Cheltenham's 2016 Open meeting] and finished second in a Coral Cup - I couldn't be happier with him. O'Neill added: "It was a good run and I'm very happy with him." Third Who Dares Wins, the bravely named Jeremy gelding who is a genuine dual purpose sort, having run and won on the Flat as well as over hurdles, ran up to his mark and more but couldn't overcome the winner Supasundae and second Taquin Du Seuil. Trained by Alan King at Barbury Castle for the HP Racing Who Dares Wins partnership, the five-year-old could well be heading back for the flat after this run. Henry Ponsonby, the manager of the partnership, said: "We haven't discussed future plans yet but we very much have our eye on the flat next. The Chester Cup is a possibility, whether he will get there off 92 I am not sure but he has won on his only start there. Also races like the Ascot Stakes and maybe even the Ebor, he is very good on the Flat. "Wayne (Hutchinson) gave him a super ride too, giving him daylight as he doesn't like to be crowded. "We are thrilled, we thought he was a bit high in the handicap but to come here and be placed is wonderful. He won the Gerry Feilden (Newbury, Nov, 2016) but this is a far better race. He had seven or eight pounds to find but it was worth coming. King added: "We are delighted up in the van all the way and no excuses. He has run a mighty race. He is probably a few pounds too high to win one of these but he has run incredibly well and everyone is delighted."